Trinity's Equality Champions Awards saw the Student Management Fund (SMF) take home first place for its work promoting women in business. 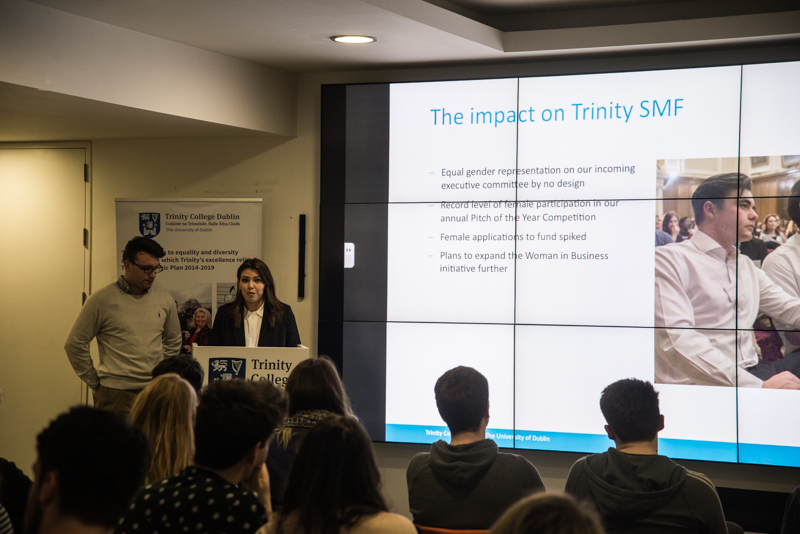 Five of Trinity’s societies were today recognised for their work in promoting equality in Trinity’s campus, with Trinity Student Managed Fund (Trinity SMF) taking home first place for their work promoting women in business. Held in the Global Room, this year’s Equality Champions Awards ceremony was hosted by Aoife Crawford, Trinity’s Equality Officer; and Prof Kevin O’Kelly, the Dean of Students.The awards began last year as a pilot project of the College’s Equality Fund – a fund, usually of about €10,000, that is available to staff and student applications for grants for projects that promote equality in Trinity. Winning clubs and societies receive a financial prize of up to €300 and can use the award logo on their materials as recognition of their work to promote equality. Opening today’s ceremony, Crawford stated that groups that have shown initiative, have addressed a need and have had an impact on a target group as well as their own society are recognised. The awards, she said, centre around themes including age, disability, gender, religion, ethnicity and family status. Trinity SMF were recognised for their Women in Business Conference last November. John Lynch, who served as CEO of Trinity SMF this year, stated that promoting equality was “not something that we have always done very well”, and something that the society has sought to actively change over the past last two years. After establishing a women in business network female membership of the society rose from 27 per cent to 41 per cent, and this year’s committee was 50 per cent female. Lynch was keen to note that this was not as a result of a “formal design”, but instead arose as a “natural reaction of encouraging more females to get involved”. Laura Gallagher, who served as COO of Trinity SMF, noted that the Women in Business Conference was the “first student-led female leadership conference in Ireland”. The event, which saw Brenda Trenowden, Global Chair of 30% Club, as keynote speaker, received national media attention. Gallagher also noted that it was important that the event had a “male perspective” with Stephen Donnelly, then an independent TD, one of the night’s panelists, and with a “great proportion” of the audience made up of men. Gallagher added that the event opened a “healthy conversation” on the topic, and highlighted the economic case for women becoming involved in business, not just the moral one. Second place went to DU Comedy and Trinity Arts Festival (TAF) for their joint event, Hysteria: Women in Comedy, which sought to address how women are typically under-represented in comedy. Shannon Buckley Barnes, Director of TAF for the 2016/17 year, noted that the event began by providing space for aspiring comedians to discuss and develop their material, offering feedback and advice. Chairperson of DU Comedy, Annie Keegan, noted that the final performance drew a “great audience”, and allowed performers to overcome subconscious anxiety about performing on stage. Keegan also noted increased participation from women in the society following the event. Third place went to the College Historical Society (the Hist) for an event about Irish Travellers organised by their Burke Sessions sub committee, which runs speaker panels. Speaking today, Patrick McDonagh, a member of the Traveller community who helped organise the event, stated that he was not highly involved in the society, he felt that the topic was often left out of left-wing discourse. McDonagh drew attention to how the event had a mix of perspectives as the panel featured both travellers and non-travellers, and cited the “lengthy Q&A session” that took place afterwards as evidence of the event’s success as generating discourse. Also recognised were Dublin University Alternative Music Society (DUAMS) and Dublin University Computer Science Society (DUCSS) for their events highlighting women in the music industry and music in the technology industry respectively. Both events aimed to highlight the importance of diversity in the industries as well as barriers to that diversity. Speaking at the event, the Dean of Students, Prof Kevin O’Kelly, highlighted the College’s belief that experiences of such diversity should take place on campus, and that examples of the diversity of Trinity’s campus are “everywhere”. While he stated that Trinity’s community is “guided by a set of principles” and a “commitment to social inclusion”, he was clear that if such policies do not manifest themselves in daily, personal interactions they are then “useless”.